West Cypress Hills is located just west of Austin in the Spicewood area near RM 620 and 2244. Downtown Austin is about a 30 minute drive and Austin Bergstrom International airport is only a 35 minute drive. Located deep in the Texas Hill Country and on the green belt, this is the location for residents seeking a escape from city life. 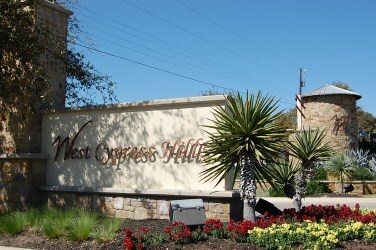 West Cypress Hills includes many nearby shopping options such as the Hill Country Galleria, Barton Creek Square Mall, Horseshoe Bay, and Lakeway for your everyday shopping. Amenities in West Cypress Hills include: Lake Travis fine dining, several championship golf courses, and neighborhood community theater. Students in West Cypress Hills receive a world-class education Lake Travis ISD schools. The high school football team has won several state championships and the student body boasts above average test scores and an excellent music program.